Am I called to stand in for Jesus as priest? Whenever I discern a difficult decision, I often think of Moses. When asked by God to go to Egypt, Moses challenges God by saying that they won’t believe him and that he’s not an eloquent speaker. What God is asking of him is outside of his own capabilities, and in opposition to his personal happiness. What does he do? He goes, and God provides for him. One night I was reflecting with some friends about powerful experiences we had had in our lives. Two came to my mind. The first was in high school performing a skit called “Pushups for Salvation.” I sat in the middle of the 150 people on the retreat as doughnuts were offered to each person individually. If they accepted, I did two pushups; if they declined, I did two pushups. The point was to give a visual representation of Jesus’ pain and sacrifice for everyone, whether or not it was accepted. It was definitely painful (300 pushups in about 20 minutes) and somewhat embarrassing to be watched in such a vulnerable position. The other story took place during adoration last fall. Without making a connection to the first story, I decided to take a different approach than most: I wanted to share in Jesus’ suffering on the cross by kneeling until the conclusion of the prayer (which usually lasted an hour). In the more than TWO hours that it lasted, I was faced with temptations such as “Why are you doing this,” “You just want to get noticed,” “This isn’t accomplishing anything,” and “You can’t do this,” along with a few more personal doubts. I expected share in Jesus’ physical pain, but never expected to share in his emotional pain as well (or even stopped to think that he experienced any, I guess). What a powerful experience that was. It was only after telling these two stories out loud that I ever made the connection: I have had my most meaningful experiences taking on the role of Christ, particularly sharing in his suffering. The following day, I was in an adoration praying and listening for some clarity when I looked over and saw a bible, and “Luke 22” popped into my head. Skeptical of course, I dismissed it, thinking, “The mind generates random bits of information all the time, looking at the bible would trigger things like this for everyone. I can think of 100 passages off the top of my head.” To my surprise, as a religion major, I was left completely blank for 5-10 seconds. Nothing. Not another book of the bible came to my head. Still skeptical, I opened the bible to see what Luke 22 was, “just out of curiosity,” to find that it was the beginning of the Lord’s Passion, where he consecrates the first eucharist and begins his suffering. What do I make of this? I’m not entirely sure. It’s more than a coincidence that my closest experiences of the divine have been of the same nature, and that this nature is taking on the role of Christ, standing in his place. 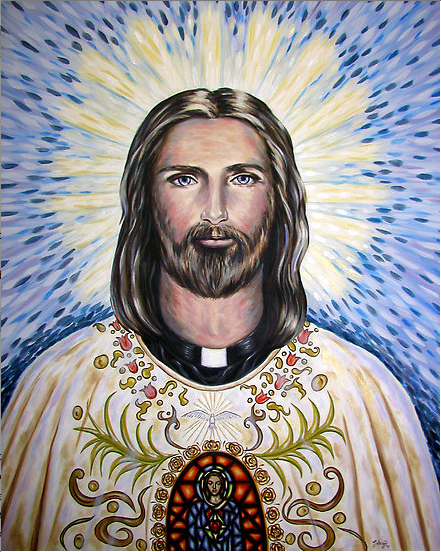 When I think about the role of the priest, I think of just that: a stand in for Christ, both in sign and reality. Is that what I’m called to be? At this point, I feel like Moses: “There are better people out there; this isn’t a calling, it’s a coincidence; how can someone of such little faith take on the role of JESUS?” As he was, I’m held back by my own fears and shortcomings, but am open to listening to God’s call. Given all that I’ve said in both posts, I find myself leaning towards ordination. There is no doubt that this will be a common topic on this blog, and I thank you for your prayers as I continue to discern. Wow! I don’t even know what to say after reading your post. It was so beautifully written. Thanks for sharing your experiences with us. The discernment process is such a spiritual gift and I know you will cherish every moment. You really have a gift for writing. Your words seem to come effortlessly and I feel honored to be a part of this journey with you.